Ask an Unbusy Police Officer - Honestly! "Huh? What? Ask an unbusy police officer?" Any police officer is a wealth of information on what's good and what's bad on their beat (the area they patrol.) It's pretty easy to see why. They walk everywhere, drive everywhere and really know the neighborhood. Ask a simple open question such as, "Where is the best coffee/fish soup/steak/inexpensive hotel/interesting place?" And they will definitely have an opinion. I make my questions short and easy to answer. I always preface my question with a short comment like, "I have a quick question about your wonderful neighborhood!" This puts the whole conversation into a more relaxed mood and lets the officer know that this is just a simple request for information and not something more serious. These professionals are often overworked and don't need any more distractions. Yet they can be some of the most helpful and pleasant people to talk to. 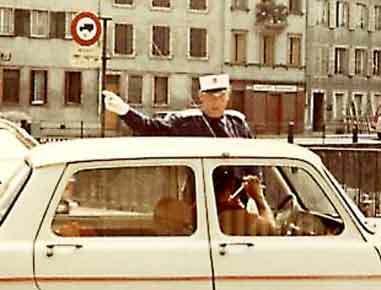 A traffic cop in Strasbourg, France, is giving directions to a lost driver. These officers are great public servants. The operative word here is "unbusy" (my phrasing). Use common sense. Don't bother a Police officer, if they are busy. I make sure that my hands are always in sight and don't make any sudden moves. It makes things a lot easier. Also remember that it can be illegal to take a picture of any officer in uniform. So it's best to ask them first. Disclaimer: Be sure to exercise good judgment on anything that you find out. After all it's your trip and your responsibility to confirm the currency and validity of all information found on this website and on your trip. 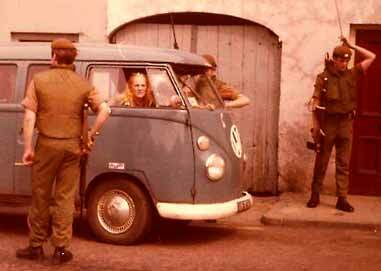 Once in 1970's, I was visiting Northern Ireland with some Canadian friends. We were stopped by a British patrol in the city of Aarmah. This was during the height of the problems with the IRA Provos. The patrol leader, a British sergeant, had seen the Red Maple Leaf Canadian flags that Canadians plastered over all their clothes and knap sacks. He announced, "Thank God. Somebody civilized!" We all laughed. We talked. The Canadians drilled him with lots of poignant questions about Irish civil rights. I listened in, not wanting to interfere with an energetic discussion between such different subjects of the British Commonwealth. The sergeant kept to the British line that IRA Provos were criminals, not freedom fighters, and that the British army was simply doing their duty. I noticed that he was getting annoyed with the direction this discussion was going. He started pointing his machine gun at my feet. I shifted away. He followed my feet with his gun. Thinking that I should change the subject, I asked an open question, "Where's a good place for lunch?" Everyone lightened up, much to my relief. He pointed out an excellent Italian restaurant just down the street. We said our goodbyes as the soldiers continued their patrol, while I herded the Canadians the opposite way to something tastier and a lot less controversial. In fact, some countries like Greece, Thailand, and Egypt have special Tourist Police, whose job is to protect and help tourists who visit their country. They almost always speak excellent English as well as other languages. They know tourist needs and problems and can be extremely friendly and helpful. The motto for Malaysia's Tourist Police Officer is "Friendly, Fast and Right." Complete the Square - Mathematics Shed Light on Travel Secrets.